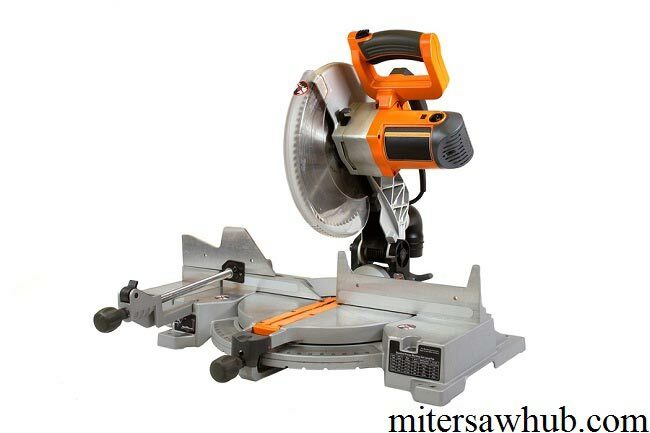 Miter saw is a tool which is getting famous both among the professional carpenters as well as among the people who use it for different simple construction purposes in their houses. The main cause of popularity of miter saw is, its tool style advancement and easy and quick use. Latest miter saw available in the market need only a little preparation before use. As compared to old and simple miter saw the new improved and more technical miter saw need little energy to carry out the desired task. Apart from this, where you are using miter saw or what type of miter saw you are using. Most important thing about it, is its safe usage. Because of its sharp edges cutting tools make its usage more critical. Careless usage of miter saw can cause serious hazardous personal damage. 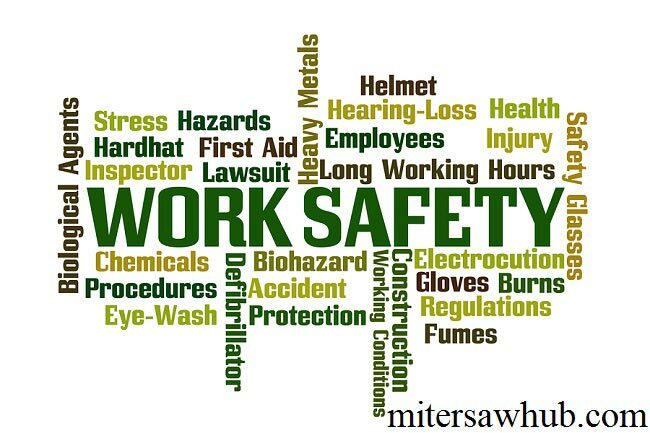 But luckily all these injuries can be prevented and avoided by simple precautions. All type of miter saws have similar safety measures. Before starting the long discussion about safety measures. I want to mention one main thing that please keep miter saw and all similar sharp edges tools away from the children and make sure when you are working with such tools kids should not around you. Following are some steps which are made to ensure your safety. Please follow them as your safety is above all. Read the “Safety Book”: Firstly read the Safety Book available with the miter saw. It include all the necessary points that are related to machine. Carefully read all the specification of the machine and all the relevant function of the device. This will make you understand that what you can do and what you cannot do with the miter saw. Try to read the whole booklet. What you are going to cut with miter saw: Always remember that miter saw is used only for cutting wood and wood like material. Do not try to cut brass, metal objects or any studs etc. cutting non woody objects causes three things (1. Excessive sparking 2. Overload the machine 3. Guard damage). All itcan cause machine damage as well as can cause injury. Stability: Before starting your work. Firstly stable the machine on a surface.The best way of securing and stabilizing the machine is to screw it with nut bolts on a wooden table. This will reduce the chance of injury and damage because of unstable machine. Use recommended Blades: Use recommended blades for cutting non-ferrous material. This will make the use of machine safer. 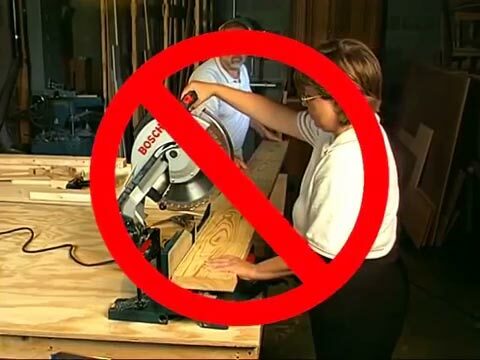 Clear unnecessary objects: Make the surface clear and remove all unnecessary objects from the table which can possible interrupt during working with miter saw. Plan your work: Make sure you are clear about what you are going to do. Plan the whole task in advance, prepare and keep the necessary objects in range. Handling WorkPieces:Here we need some skill and conscious effort to make our task safe and successful. Keep your hand at a distance from the intended cutting site. Make sure your hands and arms are not in range of blades. Loose handling can slip both hand and workpiece towards the blades and can cause injury.Support your hand at supporting site to avoid injury. 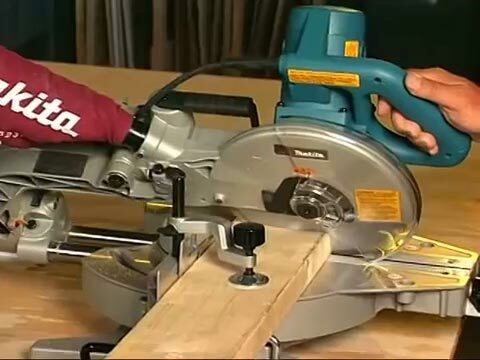 Use clamp of miter saw to clamp small workpieces. If the workpiece is too small to clamp please do not try to cut it. Other Person: Do not take another person as a substitute of table to support the lengthy workpiece. Use proper way of supporting the workpiece. Secure your Hands and arms: Do not put your hand in the Path of blade. This is one of the main leading cause of injury of hands. Do not cross your hands to the blade. Simple try Run: Before starting the cutting task make a simple try run without the workpiece. Check that machine is functioning properly or not. Apart from all above mentioned safety measure some other simple tips are here, before contacting the machine blade with workpiece let the blade take its maximum speed and after work do not touch the machine and workpiece until blade stop. 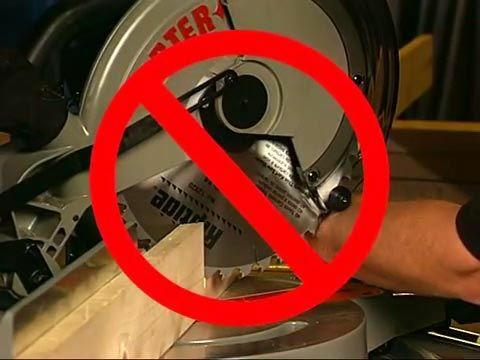 If unfortunately machine stuck or got jam then “Power Off” the miter saw first and then remove the jammed object. For uneven and curved workpieces firstly secure them with clamps and then allow to cut. Otherwise it will fly out of the machine violently and cause injury or any other serious damage. Hope so these instructions will be fair enough to help you in dealing with your miter saw.